PUMA India launches the eponymous Boris Becker shoes! New Delhi : The Global Sportswear brand PUMA hosted former world no.1 professional tennis player- Boris Becker at the launch of the PUMA Boris Becker collection sneakers. . Boris was joined by his son Noah Becker at PUMA store at Select City Walk, New Delhi. The launch was preceded by an enthralling conversation with the Father Son duo. The legend had a candid conversation highlighting his journey as a tennis player and his transformation into a coach. Boris was the first unseeded and first German player to win the prestigious Wimbledon men’s championship. During the shoe launch he pointed out how he cruised through to victory at Wimbledon ’85 at the young age of 17 with his PUMA shoes. His son, Noah Becker, spoke about his father’s significant [MD1] [UA2] [UA3] [UA4] accomplishments and how the shoes deliver beyond performance and today has become a symbol of style. The collection is a nod to tennis heritage and PUMA's tribute to the German tennis legend, this shoe is a must-have for every person who grew up idolizing the Wimbledon Champion. Originally released in the mid 80s, his PUMA shoes were Boris Becker's signature footwear on the court. PUMA and Boris developed the shoe so it supports his style of game and that’s when the mid top design was created. The latest limited edition collection which is available for the Indian fans for the first time is a beautiful amalgamation of canvas and suede, the Becker Mid Crafted is elevated by its carefully designed details. The Boris Becker Collection sneakers fuse the best of PUMA’s performance, legacy and design language. The collection is quintessential with it’s retro touch for any sneaker head in the country and provide a great staple for a fashionista looking for comfy yet cool sneakers. The sneakers exude a classic vibe while still being relevant to the current consumers, you can pair them with basics like jeans and tees, dresses or get a little experimental and opt for a suit. Talking about the shoe launch, Boris Becker said, “PUMA has always been close to my heart because it gave me an opportunity when I was 17 to go out and prove myself. Just like me, the brand has always supported young talent. It gives me immense pleasure to launch the PUMA Becker collection for the first time in India”. Speaking at the launch, Abhishek Ganguly, MD, PUMA India said "We are thrilled to bring PUMA legend, three times Wimbledon champion Boris Becker to India. Boris has been an iconic Athlete and his presence gives the Indian fans a unique opportunity to interact with him. Boris unveiled his Limited Edition PUMA Footwear, which will be available for the first time in India, amidst his fans and sneaker heads of the country. His collection is inspired from what he would wear on court during his playing days. It gets his heritage to life in a very modern rendition . The product checks in with the current Athleisure trend. Boris will also be the attending Tata Steel Kolkata 25K race to promote running and healthy lifestyle." The dynamic PUMA Boris Becker limited edition collection keeps things simple but adds oodles to the style quotient! 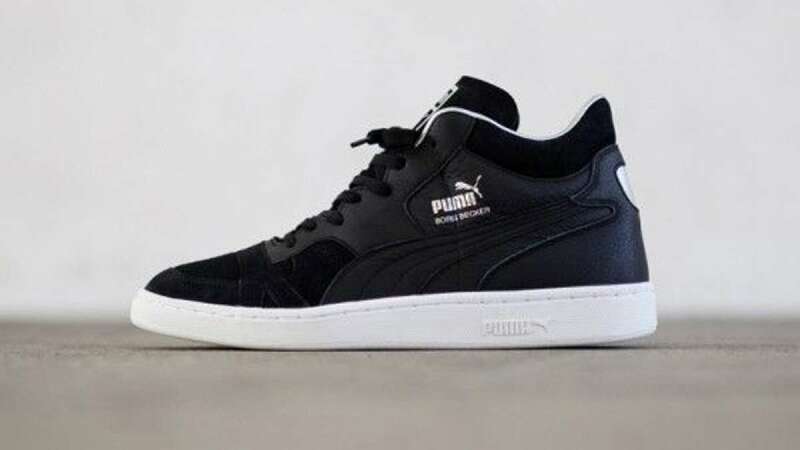 The sneakers are now available at a price of Rs.7,999 across all PUMA stores.